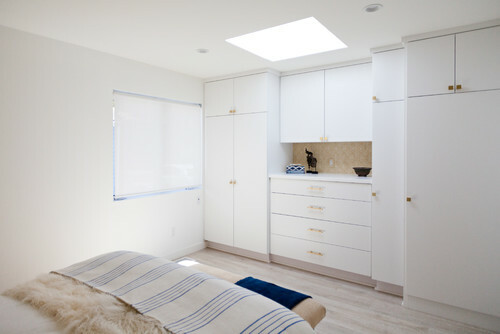 A mobile home redo that's smart and chic is this week's featured small home. The owner, who had down-sized from a large home to live full-time in her vacation mobile home, purchased the mobile next door when it came up for sale. Remodeled, and decorated in global boho style, it's now used as a guest house for her adult children and friends. 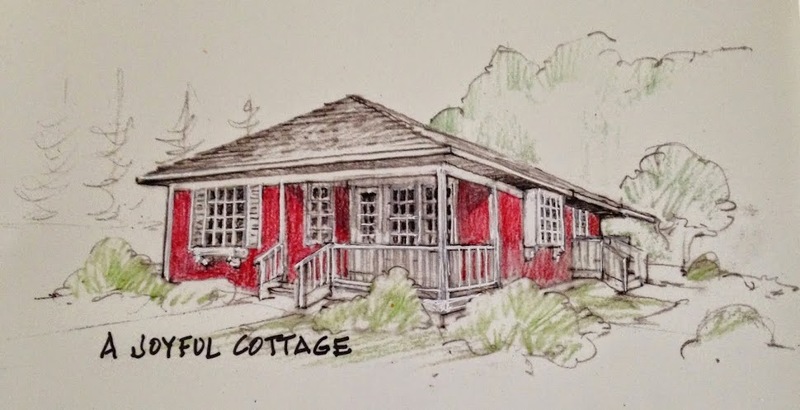 Located in Paradise Cove of Malibu, California, this 600 sq ft beauty began life as a fairly common mobile home. Just to put things in perspective though, the NY Times calls Paradise Cove "America's Most Glamorous Trailer Park". First developed in the 50's and then expanded in the 70's the park's mobile homes today range from $400k to over $4m and space rents run from $1500 to $3000 per month. I say let's put real estate prices aside for the next few minutes and allow ourselves to be inspired by the interior transformation of this 1 bedroom, 1 bath mobile home. Before the remodel the home seemed dreary and cluttered. The after photos reveal a breathtaking makeover. 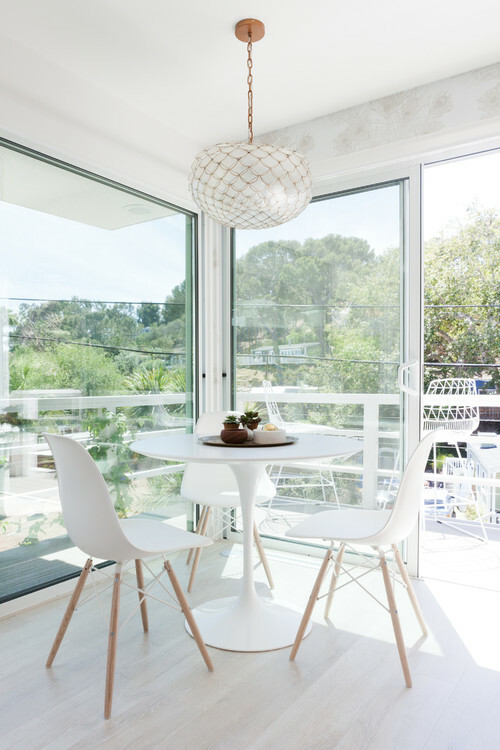 Old sliding doors were removed and replaced with larger doors that allow for more natural light, not to mention fabulous views. Bar stools were placed outside near the deck rail to take advantage of the top rail's 14" depth -- great for holding plates and drinks. The floors are white wash oak laminate. Walls are covered in wallpaper called "Peacock Feather". A sectional really makes sense in a room this small. It allows for better traffic flow and helps the space seem larger. 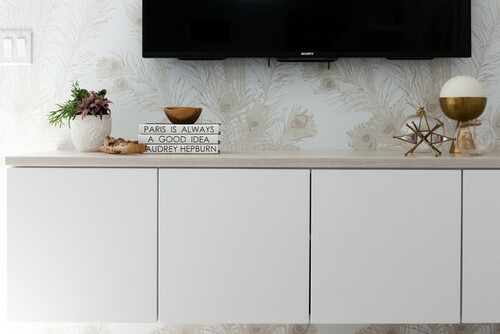 The custom floating cabinet under the TV houses media equipment and provides storage to keep things tidy. The new streamlined kitchen is bright and nicely appointed. 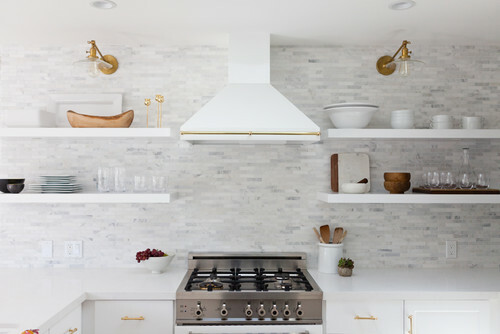 Floating shelves instead of upper cabinets open up the kitchen. 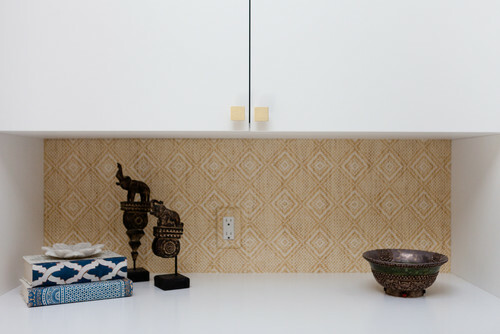 Counter to ceiling tile gives the wall a clean, sleek look. The floor to ceiling cabinetry on the right side of the kitchen conceals a pantry and refrigerator. 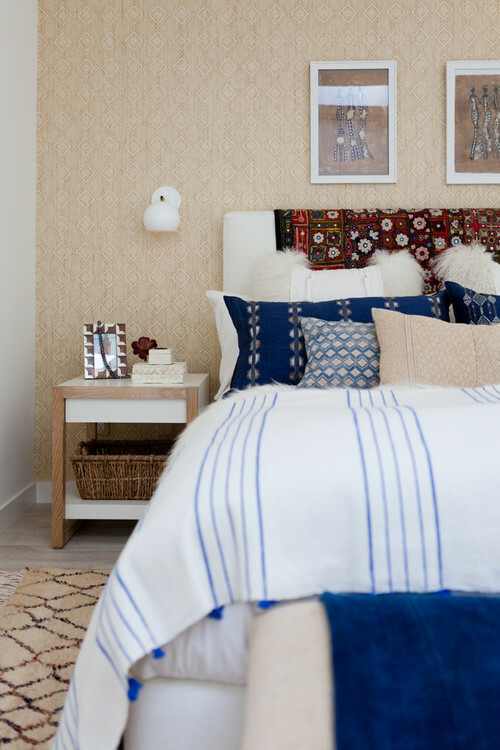 While the bedroom is minimalist in content, the layered textiles and warm wallpaper keep it from feeling stark. Bedroom built-ins have double rods, drawers and a washer-dryer. 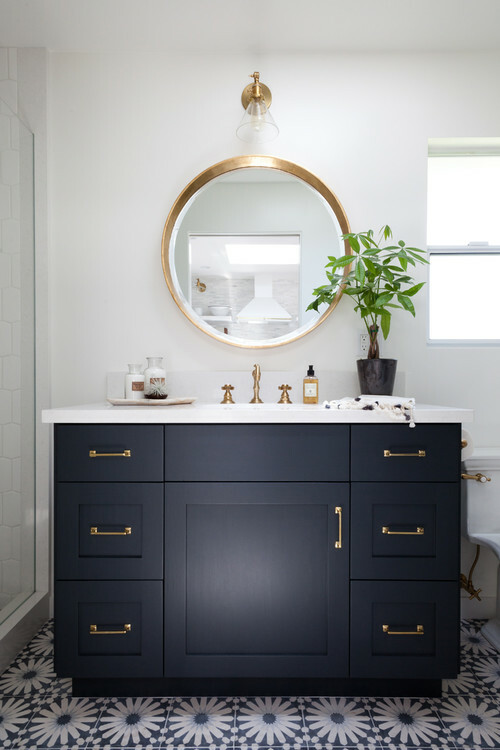 The bathroom is stunning with dark blue custom vanity, Caesarstone vanity top, and brass fixtures, and hardware. The flooring is handmade cement tile. Much of this particular remodel specified custom materials and work, but I can see how a project like this could be done in a budget-friendly way. Can you? Mobile home? Sure doesn't seem like one, but with 600 square feet keen organizing skills and editing is a constant thought. 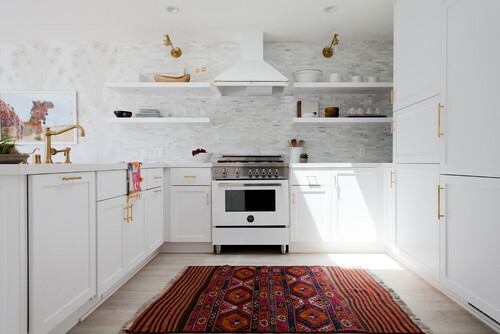 Love global boho and with white walls and vivid pops of color this uncluttered space lives large and is packed with personality. Fun tour today, thanks. This home is gorgeous and in no way resembles the mobile home that it really is. I could live in that! And yes, it could be done in a more budget friendly way, I think. But this is perfection, isn't it. This is so well done. I love the light! But can you imagine, 4m for a mobile home? It would fall apart over time. I guess location is everything! Wow! This is quite a long way from any mobile home I've ever seen. 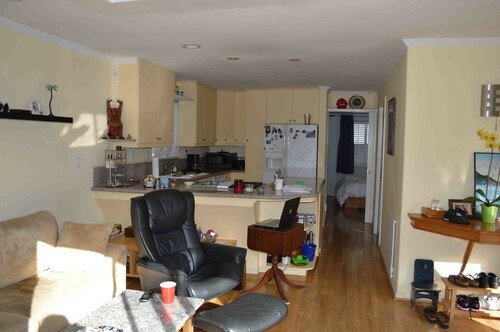 It is so bright and airy and has an air of spaciousness. The before and after are worlds apart! I don't know if I am a huge fan of the peacock feathers, but that wall of windows...wow!! Is this not living grand in any space. I bet a paper box can become a thing of beauty if one takes that leap of faith in doing so. Love how open this Mobil home has become. To think that this is a mobile home truly amazes me ! I love the white how it opens up the place. The colorful accents are done in moderation making it very elegant. I liked this space very much! The home looks really beautiful. The white looks beautiful. My grandmother lived in a vintage mobile home. She made it into a cozy little place. It was fun to visit her. I love how they made such great improvements, both in using space so well and decorating with such aplomb! Only problem is when bad weather arrives - mobile homes are not safe in tornadoes and hurricanes - but of course in Malibu you don't have to be concerned. . . . except perhaps for earthquakes!! 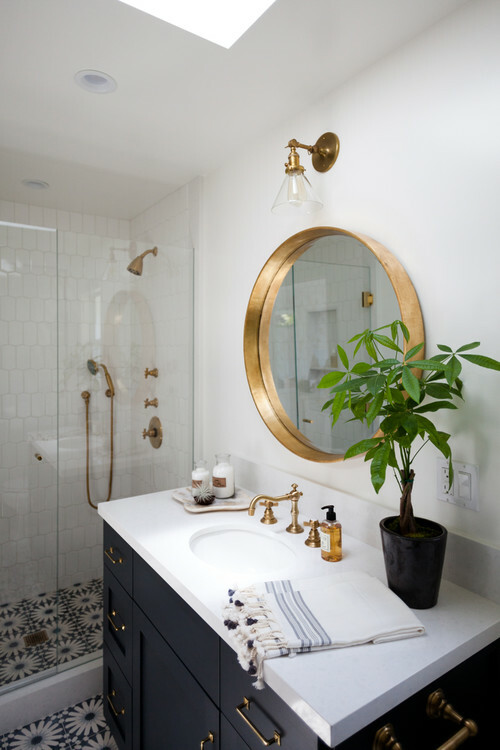 Love the kitchen, but my favorite has to be that bathroom - so elegant, the hardware, the splendid tile - both white and patterned, and oh that blue vanity, LOVE IT - WANT IT! WOW. I would have never thought a mobile home would look so good (or even cost that much!) but this makeover is remarkable. Number one, the clutter HAD to go. 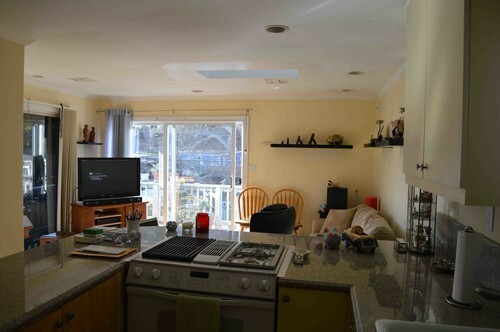 As I look at the before photo of where the TV was settled, that took up so much space. By simply placing it on the wall, it made a huge difference. 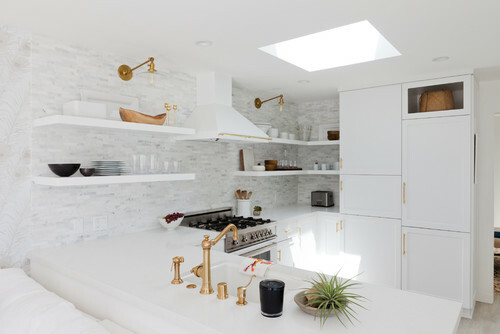 The white...OH, the white...it opens up the area, allows the sun to bounce off and then that TILE in the kitchen.....DREAM! Another excellent choice my friend! This is a gorgeous transformation. So much creativity and imagination went into it. I would love to be a guest staying there! Mobile homes for $400,000? Not my idea of what a mobile home is from what we have here in Upstate NY. Here, it is the last place you want to say you live! This one is gorgeous! That bathroom is the best room in the place. A perfect example of what some paint and a lot of money can do!! I'm blown away by the transformation of the mobile home! 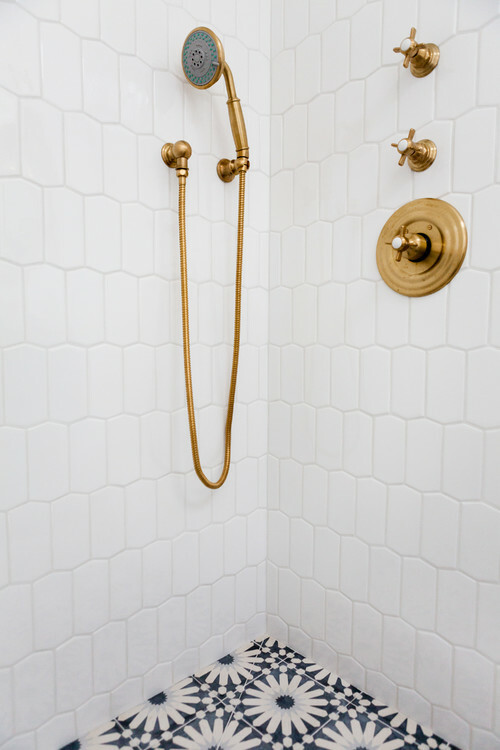 My favorite thing is the gorgeous cement tile in the bathroom. Thanks for taking us along on the tour today, Nancy! Beautiful remodel of this space, it doesn't even resemble the mobile home that it once was. It's open and bright and just gorgeous, especially with all of the custom touches. Thanks so much for the tour. Sure doesn't look like a mobile home make over . . . or does it look like only 600 sq ft . . . I liked the comfy, cuddly, pillow filled sofa surround . . . Interesting patterns and designs in the pillows . . . Very white . . . I guess if one has an extra 400, 000 . . . why not . . . BUT . . . I prefer an entirely different look for my 600 sq ft.
Again this week, the bathroom is a favorite of mine. Wonderful. I wouldn't have thought some of the wallpaper and flooring would be to my liking but it goes so perfectly. I could definitely enjoy my morning coffee at that corner table with a view. Amazing what some people do. There are all kinds of smaller home solutions aren't there? Enjoyed visiting and I am a new follower. Quite the change ~ who says living small can't be beautiful? 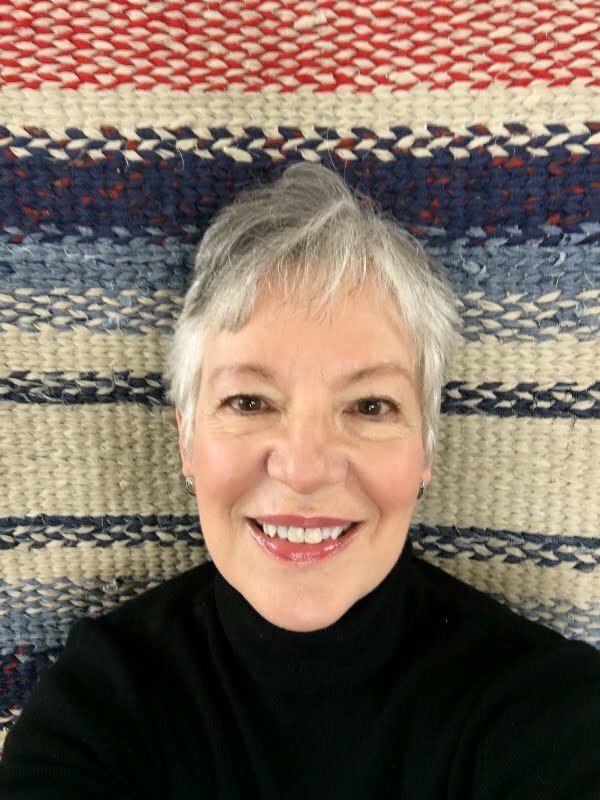 The owner's blog is a delight to read, too. BTW, I know Paradise Cove in Malibu as there is a cafe and beach there (parking is impossible!). Four million is more like it for any property there. I'm shocked that this is a mobile home, Nancy! I've actually been to this trailer park, but it was in the 80s and the one I went in was nowhere as nice. It's not my taste, but it's certainly a major change. I hope you're having a good week, my friend.